To promote balance, and a healthy environment for healthy food production loosen soil with a garden fork and do not turn it over. Keep soil moist and healthy soil life will flourish. Plant roots will benefit, some green leafy vegetables will tolerate partial shade though most plants benefit from a sunny airy position. Air is moist and warm. 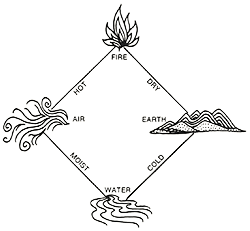 It is a good exercise to practice detecting the four elements and to try to describe all observable phenomena in these terms. Many secrets of nature reveal themselves to the observer, and that without the aid of complicated instrument or technical literature that abounds with abstract jargon. If practiced correctly, one has at one’s disposal a means of finding the keys to successful gardening without the aid of a distant specialist.